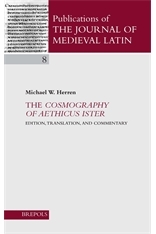 One of the most skilful forgeries of the Middle Ages, the Cosmography of Aethicus Ister has puzzled scholars for over 150 years, not least because of its challenging Latinity. Written at a western centre in the first part of the eighth century, the work purports to be a heavily censored epitome made by St. Jerome of a “cosmography” by an Istrian philosopher named Aethicus. This writer, who is otherwise unknown, describes a flat-earth universe resembling that of Cosmas Indicopleustes, then gives an eye-witness account of his travels to the “isles of the gentiles” in the North and East. There he encounters not only savage races, but also monsters, Amazons, and other figures of mythology. Alexander the Great also figures prominently by immuring the “unclean races”, who will escape to ravage the world at the coming of the Anti-Christ. Not all is fiction. The author’s observations on volcanoes, earthquakes, and tsunamis will interest the scientific reader. The last part deals in coded fashion with contemporary events in the eastern Mediterranean and the Balkans, and may provide a clue to the author’s origins. The present volume offers a new critical text, the first translation, and a detailed commentary covering every aspect of the work. Michael W. Herren is Distinguished Research Professor of Classics emer. at York University, and the editor/translator of the Hisperica Famina, Aldhelm’s prose works, and the poems of John Scottus Eriugena.